When Barack Obama with great fanfare signed the 2009 stimulus bill, he quietly gutted America’s most successful domestic policy achievement — the 1996 welfare reform. This revolutionary policy had freed millions of Americans from the shackles of dependency. There was no legitimate reason to undo what had succeeded, and the moral and economic costs will be huge. The facts are clear: welfare reform worked for America. And we urgently need to relearn why. 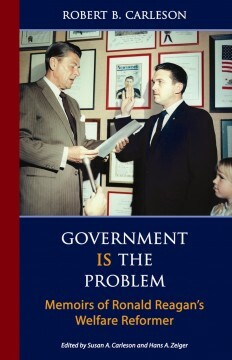 Government Is the Problem is the story of a broken welfare system that needed to be fixed, of a great leader named Ronald Reagan who said that it could be fixed, of doubters who said that it could not be fixed, and of the man — Robert B. Carleson — who fixed it. Carleson pioneered the true reform that reversed a growing dependence on the welfare state and moved America away from the ruinous path of income redistribution. Much has been written about welfare reform over the years — a lot of it by people who had no involvement with the process. But in this book the real story of how welfare was fixed is told. Carleson has left a fascinating memoir of the insights and ideas that motivated welfare reform; of the controversies and obstacles that threatened to derail it; and of the principles that must be followed to direct scarce public resources to the truly needy. With the country in economic crisis, Americans are asking questions about government intervention in the economy, about individual responsibility, and about the future of our children’s freedom. What could be more poignant than a testimonial from the man who proved that government is, indeed, the problem? Robert B. Carleson (1931–2006) was the principal architect of true welfare reform. In 1968, Carleson joined the administration of Governor Ronald Reagan as Chief Deputy Director of the California State Department of Public Works. He was the main author of Governor Reagan’s successful welfare-reform initiative. Then, as director of the California State Department of Social Welfare in the early 1970s, Carleson implemented the new reform. For the first time since World War II, California’s welfare rolls began to decline. In 1981, Carleson joined Reagan’s White House staff as Special Assistant to the President for Policy Development. In that role he served as a special advisor for federalism policy and was the Executive Secretary of the Cabinet Council on Human Resources. He was the author of the Reagan welfare reforms contained in the 1981 Budget Reconciliation Act and was instrumental in the design of the welfare reform signed into law by President Clinton in 1996.